Kawasaki is so worried about the repercussions of a 900cc sports bike hitting the symbolic 300kph mark, it has deleted the offending " 300 " from the new ZX-9R’s speedo. That’s what it looks like, anyway. We’ve managed to track down a Euro-spec version of the 2002 model in Germany, a month before anyone else will ride it. And where you’d expect the triple-ton figure to be, there’s just an unmarked grey line. And blow me if the needle isn’t heading right towards it. As the thing howls under acceleration, the tip passes 270, 280, 290, then sweeps through the thin grey line as if to say: " Look what I can do. " Meanwhile, the thought going through my mind is: " If I was at home I would be thrown in jail for ever. " This is Deutschland, though, where it’s perfectly legal to discover that, on a public road, 12,000rpm in top gear on a ZX-9R requires a hell of a lot of concentration. The inside lane is full of lorries, but this is my chance. I keep my head down, get the throttle pinned and can feel my pupils flicking frantically between trucks, road, bridge, road, rev-counter and speedo. Then bang. 186mph (300kph) on a standard 900cc road bike, and the polizei can’t touch me for it. It feels good, ja. OK, so it’s only a speedo figure. But it’s still shockingly fast for a 900. 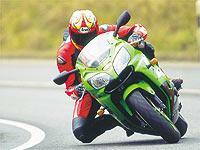 The ZX-9R has been many things in its last three guises. Fast has always been one of them. Point-to-point on a track or cross-country on the road, a GSX-R or R1 would kill it. So would a Blade. But if hardness is measured in howling straight-line speed and face-bulging acceleration, the ZX-9R is the Mike Tyson of superbikes. You don’t have to wait for him to punch you to know what you’re taking on - all you have to do is look at the eyes. The 2002 bike is as fast as ever, but a number of changes have made it much more flexible. It does everything the old one did, but is now even more accomplished. One main change is to the chassis. It has been beefed-up around the headstock, there’s a new subframe and it’s attached to a much racier-looking swingarm, which still has those lovable old R-pins through the rear wheel spindle. The front and rear suspension settings are stiffer, there are Nissin four-piston calipers in place of the old model’s Tokico six-pots and a new exhaust system, plus new clocks. A quick look at the outside proves all that glistens is not gold – instead, it’s magnesium. The metallic stuff is used for the cylinder head and engine covers which poke out of the black lower fairing. In the motor itself, there are new third and fourth gears for smoother operation, a heavier crankshaft, new cams and valves and a redesigned ignition system. So the bike has undergone some serious changes – though you won’t have to pay any extra for them, as it will go on sale for the same price as the old model at £8995, and you’re bound to find deals well below that. You’ll have to wait until March to get hold of one over here, though. If you saw the bike at last year’s NEC Show or this year’s Ally Pally, you probably walked straight past it on your way to the new Blade or R1. I did. But when I get my second glimpse of the bike, parked in a layby on the outskirts of Cologne, I realise I wasn’t doing it justice. It looks hot. The changes are subtle, but they work. The front end has been tweaked for better aerodynamics, which means the nose is a bit sharper and the ram-air intake has taken on an aggressive Jaws-like appearance. The other end loses the bulbousness and goes for a curvier look like a GSX-R1000. It’s enough for Blade owner and MCN snapper Howard Boylan to totally change his mind about the Ninja’s looks and say he might even buy one. I can see his point, as the ZX-9R’s green bodywork gleams menacingly in the gloomy, early-morning winter light. Cleverly, what looks like a seat hump is actually a proper pillion perch complete with a pad, pegs and underseat storage. But, together with the more sharply-angled subframe, it makes the bike look even more aggressive, as if it’s crouched with its rump in the air, ready to pounce. The exposed frame rails give it a lean and hungry look, as if its bones are showing through its flesh – though as the weight has gone up from 183kg (402lb) to 186kg (409lb) it’s carrying more fat than it looks. Get on it and it feels just like all ZX-9Rs – big and welcoming, with wide bars and high pegs. It must be the last big sports bike with carbs, so it still has the choke lever on the left-hand side – and really does operate a choke rather than a fast idle lever. Press the button and it throbs, hums, then starts to growl and you know the ZX-9R has lost none of its ability to scare you if it wants to. Boylan wants some nice pictures of the bike in front of the Dom, the impressive Gothic cathedral in the middle of the city, so the first thing I have to do when I get on is negotiate traffic to get there. Cologne on a Monday morning is a very busy place. Conventional wisdom says this isn’t the best environment to test a sports bike’s attributes, but how many people don’t ride through town on their way to a bike meet or warm evening blast? Unless you live on your favourite road, a ZX-9R needs to be an urban beast as well. The heavier crankshaft and engine internal changes are claimed to improve the Kawasaki’s mid-range as well as its low-down power delivery – which is something you need lots of to fight your way through massed ranks of VWs, Opels and Beemers. And the ZX-9R has it in carrier bags. The riding position is much like the old bike, so it’s sporty without being cramped like a GSX-R, which instantly puts you in a fair position for town riding. It may be heavier, but weaving around the Cologne’s tram lines shows just how agile it is. Maybe it’s the wide bars, or the way you sit on top of it, but it’s one of the easiest sports bikes around to hustle on the courier run, CBR600 excluded. The ZX-9R ticks over all off-beat like it’s not quite set up properly. It’s fine – they all do that, mister. But no matter how hard you try, you can put the ZX-9R in as low a gear as you like and the thing won’t cough. It just drives from nothing. Get to 5000rpm and the mid-range comes in, but there’s no significant kick. The way it feeds in is treacly-smooth, so you never feel you’re about to end up in the back of a Smart car. Dial in as much throttle as you want and the new 40mm Keihin carbs (same size as the old ones, but with more accurate fuelling) and throttle position sensor get on with driving the bike hard. After a good half-an-hour, your wrists do start to ache, but that’s about twice as long as on some more radical sports bikes. Something else you notice is that the temperature gauge gets to 100°C with worrying regularity, especially after a wait at one of the endless red lights. But the fan soon steps in and cools things down. The radiator’s new and there’s also a water-cooled oil-cooler for hot climates or slow-speed use. This is definitely the latter. A-roads, but they’re beautifully surfaced and throw up the occasional collection of tight bends. The only giveaway that this is Germany are the road signs, otherwise it could be Holland – or even Cambridgeshire if the roads weren’t so well looked after. Give the ZX-9R some room and it shows why it is one of the best sports bikes on the road, though aimed more at the Blade than the GSX-R and R1. It’s often overlooked, but it’s easy to see why Kawasaki riders keep coming back for more once they get bitten by the green bug. Find a good stretch of road, give it a handful and it’s no surprise the bike sits back on its fat, new swingarm. What’s more of a surprise is how quickly it revs, snarls and grunts its way to the point where enough is enough. This is one very quick bike. It doesn’t advertise it, though. The new stainless steel silencer has lost a bit of its bark, and the twin-snout ram-air system is more efficient than the single-snout version, but makes less noise. However, the motor has lost none of its bite. You don’t need to go below 5000rpm or above 9000rpm for very fast road riding. It’s also a lot more stable than the old bike and the weight is better positioned. Come out of a bend at 5000rpm and there’s absolutely no drama. If you gave the old ZX-9R a real handful while cranked over, it would rear up on to its back wheel and get all lively. This one comes out hard in a controlled way, and it’s so good at telling you how much grip is left from the Michelin Pilot Sport tyres you can almost feel the tread pattern. The old one would tell you how much grip there was, too, but in a squishy kind of way. Controlled doesn’t mean slow, though. You can exit the corner with the power hard on and keep it there, with the front wheel just kissing the Tarmac as the power rushes through the rear 190-section rubber. This is partly due to the smoother, more accurate power delivery, which means the engine provides exactly what the throttle asks for, but is more down to the stiffer rear suspension and swingarm, which keeps everything in place. For harder riding, the ZX-9R is still not as focused as a new Blade or GSX-R, but it has closed the gap. And the junking of the remote-feeling Tokico six-piston calipers is one of the best moves Kawasaki has made. It just goes to show that sometimes less really is more. The new Nissin four-pots and bigger 320mm discs – up from 310mm – look very much like the Nissin set-up on the new Blade, and they perform the same. Pull them hard and you’ll treat the screen to a very good impression of an Iron Maiden fan. Only the lightest touch is needed to slow the bike down. despatch corners feeling much more confident. There’s also a ride-height adjuster for the first time, which should make it even quicker-steering if the standard bike doesn’t react quick enough for you. For me, on the road it turns well without being laser-quick like the GSX-R1000. Though most of the 150 miles I rode on the ZX-9R were dry, Germany doesn’t seem to give you much chance to really get a bike heeled over. But back in Blighty, you’ll find ground clearance is improved with a higher-level exhaust pipe and tucked-in engine covers which are less likely to scrape. The only person I can think of who might have scraped them in the past is Steve Plater when he took a ZX-9R Superstock racing a couple of years ago, but it’s nice to know there’s now even less chance. Away from back roads and on the autobahn, the ZX-9R lives up to its do-everything role perfectly. Yes, it will see 300kph before you know it, but it will also sit at a relaxed, rather more bobby-friendly 70mph at 5000rpm, right where the real meat of the power starts, ready to hurtle out of sight as soon as some cocky driver tries it on. Kawasakis never show their true potential on the dyno as most tuners reckon the ram-air system is worth around 10bhp and no dyno in the world can push a 160mph wind through a static bike. But look at the dyno curve we got done out in Germany and you can see how strong it is. Twist the throttle at 5000rpm and you’re right where it needs to be, making it perfect for nipping out between Porsche 911s doing 160mph – about the only thing that will hassle a bike on a German motorway. But go faster and you start to notice a few more vibrations than on the old one at high revs. The motor revs cleanly and quickly, but squeezing a bit more out of it starts to make it feel a little bit unhappy at higher revs. However, you only really notice when travelling at the cruising speeds the continent allows. At those speeds, you also discover it’s as rock-solid as it is in the twisties. I even smacked the bars around a bit in a potentially rather silly attempt to force it into a tankslapper. But, like Bill Clinton when he was being questioned about Monica Lewinsky, it absolutely refused to deviate from its line. The wind protection is also good and if you’re travelling fast at night the headlight throws a reassuringly wide spread across the road. The ZX-9R really is a Jack-of-all-trades. Even if, in reality, it comes fourth out of four behind the Blade, GSX-R1000 and R1, it now pushes them that little bit closer.